Planning a home renovation or making decisions on interior finishes for your new home? Flooring has a significant impact on the style and feel of a room so it is worth putting in the time and effort to make the right decision. With such an investment you definitely want to do your research. The fact that most floors endure wear and tear everyday means that just as important as the look of your floor, are both its functionality and maintenance requirements. Where to begin? Start by choosing a flooring store that will work with you to find the perfect product for your space and budget. Choose an Experienced Company that Specializes in Flooring: Companies, like Decor Floors, that exclusively sell flooring products, have the expertise to help you make the best, informed decisions for your space. They can guide you through the entire process of choosing the perfect floor that meets all your needs. Working with experienced professionals means you can avoid making expensive mistakes and disappointment. Choose a Company that Carries Quality Products: Work with a company that carries quality products. Established, well known brands come with clear, trustworthy guarantees that ensure the quality of their product. Customer reviews of these brands are easily found online, so you can do your own research as well. At Decor Floors, we have a wide range of quality brands and types of flooring including hardwood, laminate, vinyl, bamboo, cork, area rugs, carpeting, and tiles (in ceramic, granite and marble). Armstrong Flooring, Satin Flooring, Olympia Tile+Stone, Fabrica Fine Carpet and Rugs are just a few of the quality brands that we proudly carry. Choose a Company that Provides Services for a One-Stop Shop Experience: Any flooring choice is going to require proper installation. If you have followed the above two suggestions and you are working with experienced flooring professionals that sell quality products and care about their customers, then take advantage of their professional installation service. Save yourself the headache of first finding an installer and then coordinating the delivery of the product with the installation. 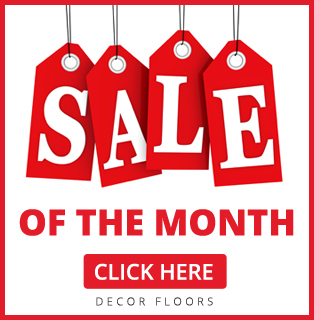 At Decor Floors we provide full service installation of our products. All of our installers are trained, insured professionals that meet the highest standard. Choose a Company with a Convenient Location or Makes House Calls: Flooring is a product you are going to want to see and feel before purchasing, so choose a store that you can visit at least once or twice before making a final decision. With 3 locations in the Toronto area (Toronto, Mississauga and Brampton) Decor Floors is easily accessible. And if that still isn’t convenient for you, we will visit you at your home with samples of everything you are interested in! Choose a Company that Your Can Trust: Online reviews and website testimonials are a useful tool when determining customer satisfaction. Also, noting how long a company has been in business can be a good indicator of its success. If you have the time, visiting a store and talking to the sales people to gauge their level of knowledge and competence while also seeing the products can provide you with what you need to know. Decor Floors is a family owned flooring company that has been in business since 2001. Our staff of flooring experts, quality brand name products, services, and 3 convenient Toronto area locations are all what make Decor Floors Toronto’s best flooring store.